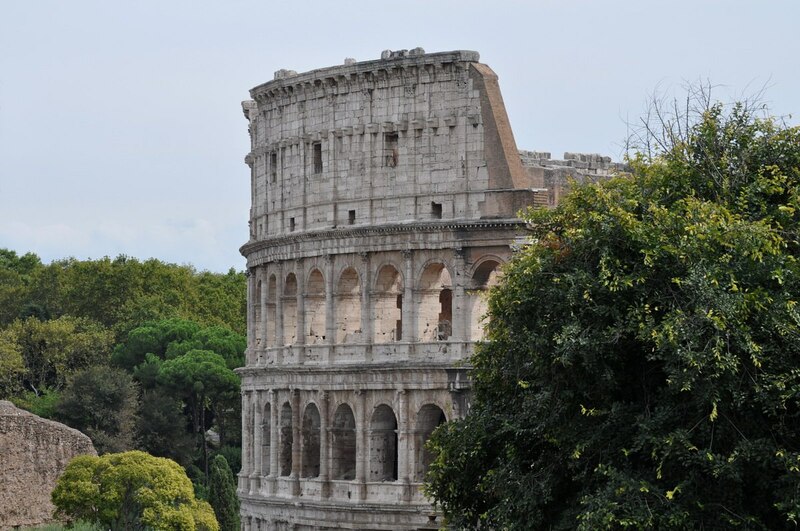 Of all the ancient ruins in Rome, Italy, for me it was The Colosseum that I most looked forward to seeing and exploring. We did not make straight for The Colosseum on our first full day in the city, but instead preferred to set the stage by checking out The Roman Forum just east of there which gave us a sneak peak of the iconic stadium from one vantage point. 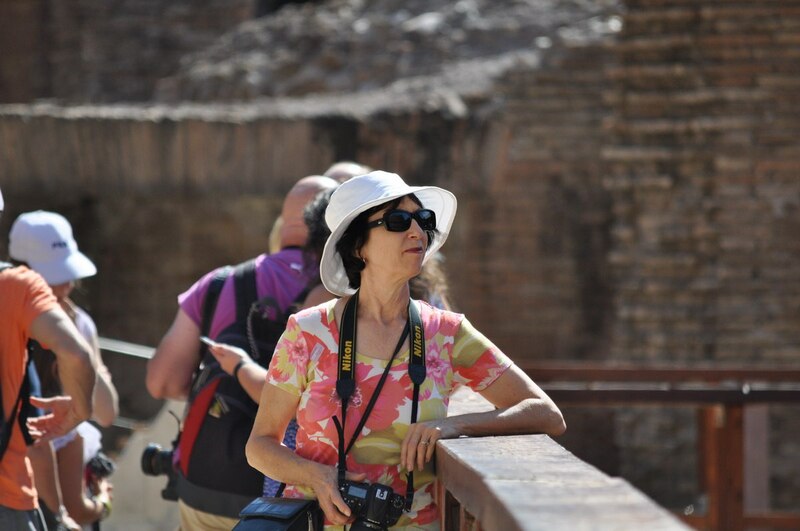 I will not presume to give you a detailed history of The Colosseum but will offer up tidbits of information that we gathered from the guided tour as well as some of Bob’s interpretations of past events. 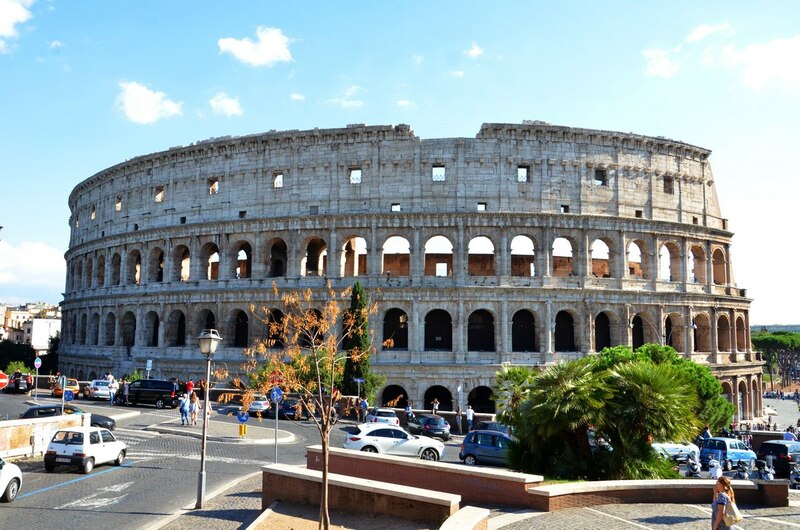 Even before we left Canada, Bob had purchased two 3-day passes called Rome Passes that gave us unlimited use of the city’s subway system and covered some of the entrance fees to major attractions including The Colosseum. Just like in Paris when we emerged from Le Metro at the foot of the Arc de Triomphe, Bob navigated the subway system with ease and had us coming above ground right at the base of The Colosseum. The sheer size and artistry of it blew us away. 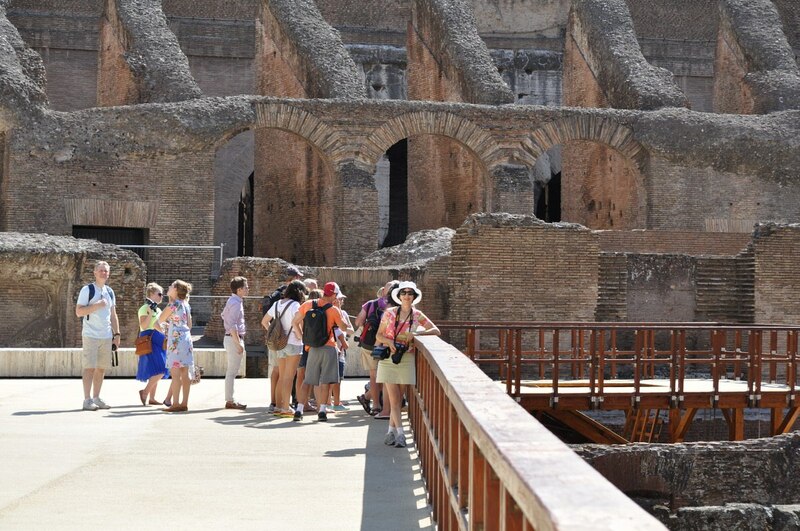 We arrived on site right about noon to find huge lineups of people waiting to buy tickets for the ruins, those people who did not have a previously-purchased Rome Pass. The short lineup that we joined moved quickly and had us inside the amphitheatre in no time. To get a feel for the structure, Bob and I completed a self-guided tour to start with. 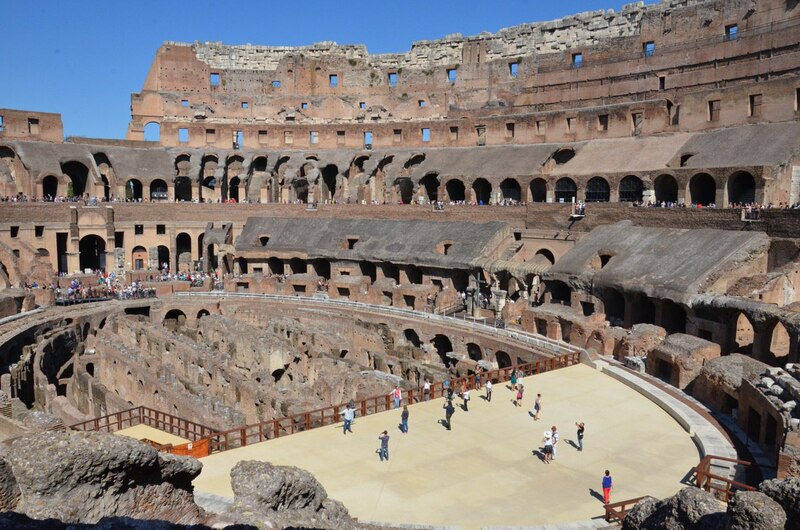 The huge oval amphitheatre, also called the Flavian Amphitheatre, is the largest amphitheatre ever built, and our legs were put to the test as we climbed up and down the levels multiple times and completed a couple of circuits around the arena all the while jostling the crowds. 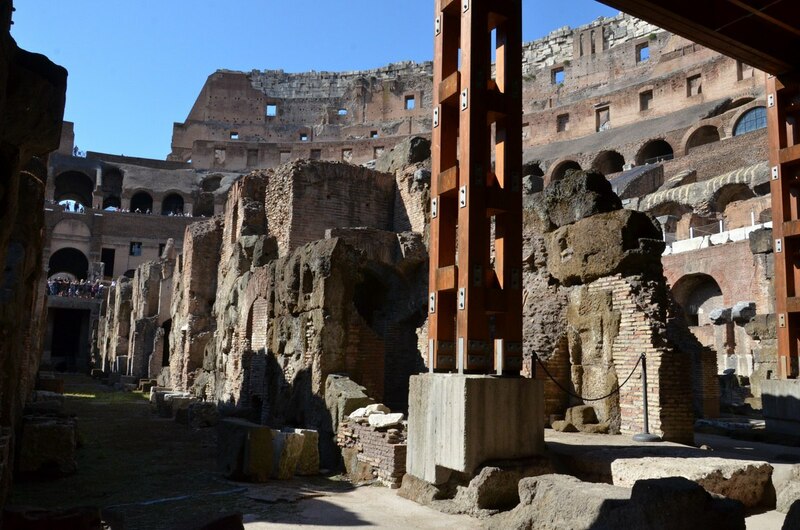 In order to help visitors visualize The Colosseum as it was in Roman times, a small section of the stadium’s stage in the central arena has been reconstructed. 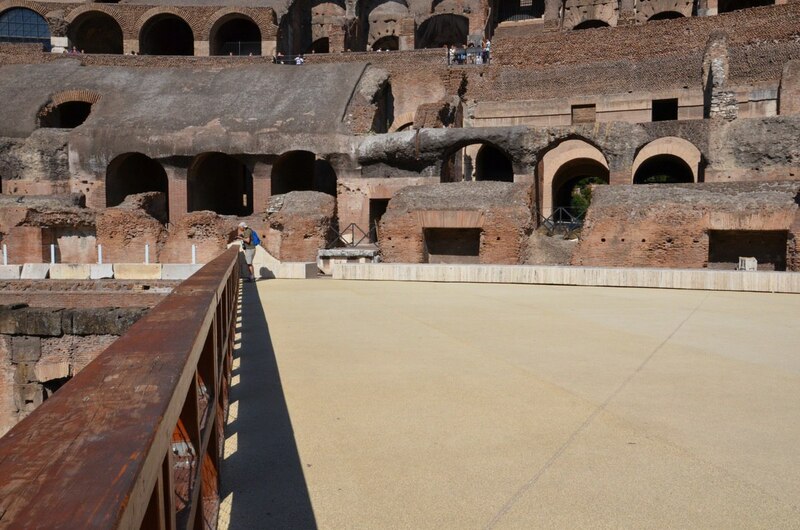 Access to the stage and also the uppermost tiers of The Colosseum are strictly controlled. When Bob and I saw other tourists walking out into the middle of the arena, we knew we had to follow suit, but that would come later. 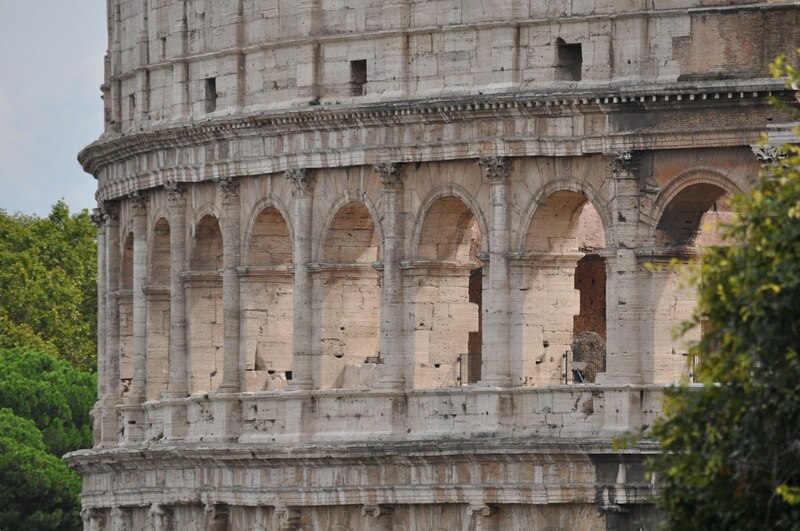 It was after the Siege of Jerusalem in 70 AD that the reigning Emperor Vespasian used his spoils to build The Colosseum. This populist gesture had Vespasian gaining much favour for two reasons. 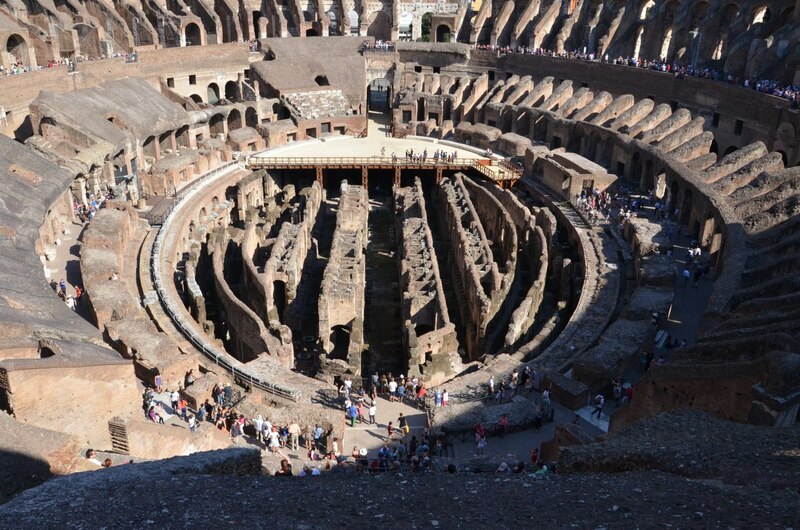 One, the location of the amphitheatre was readily accessible by the populace because it is located in the heart of Rome whereas most other arenas were on the outskirts. 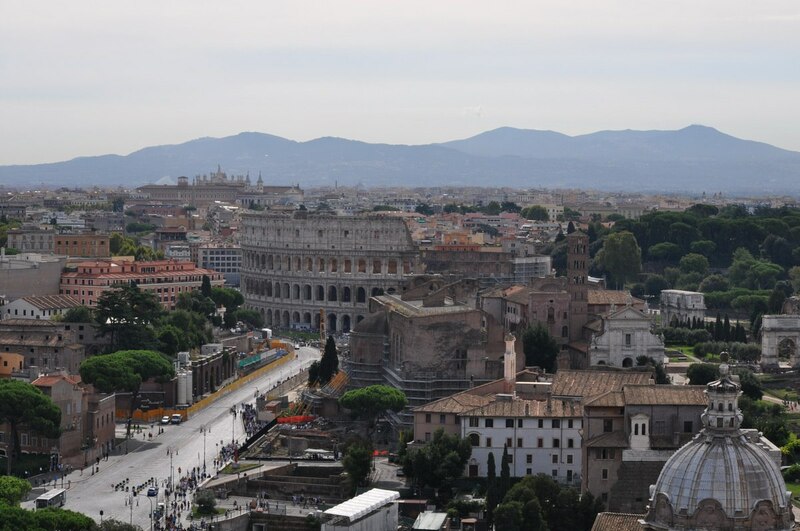 Two, his decision returned the city centre to the people, an area of land that the previous Emperor Nero had claimed as his own and turned into a lake. 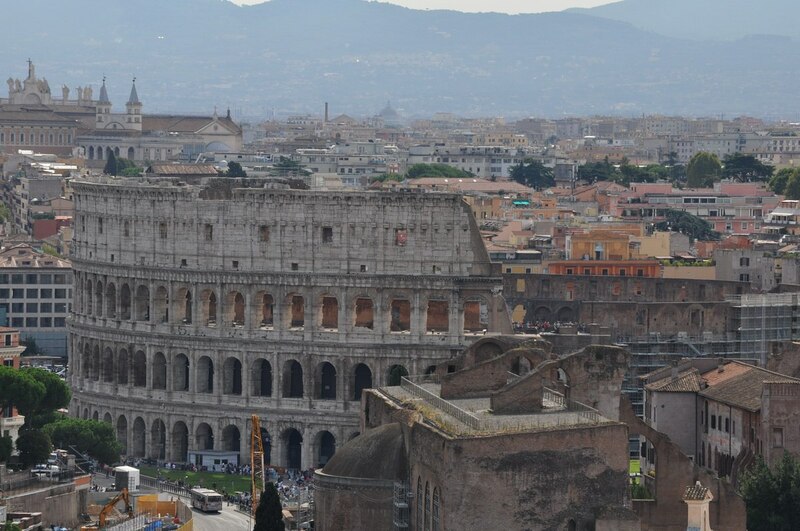 The Colosseum was built with concrete and stone in an astonishing short length of time…only 8 years…between 72 AD and 80 AD. The unbelievable feat was accomplished by using a massive number of unskilled labourers, Jewish prisoners who were enslaved into service, in combination with skilled engineers, builders, painters and designers. The end result is one of the greatest works of architecture and engineering on Earth. 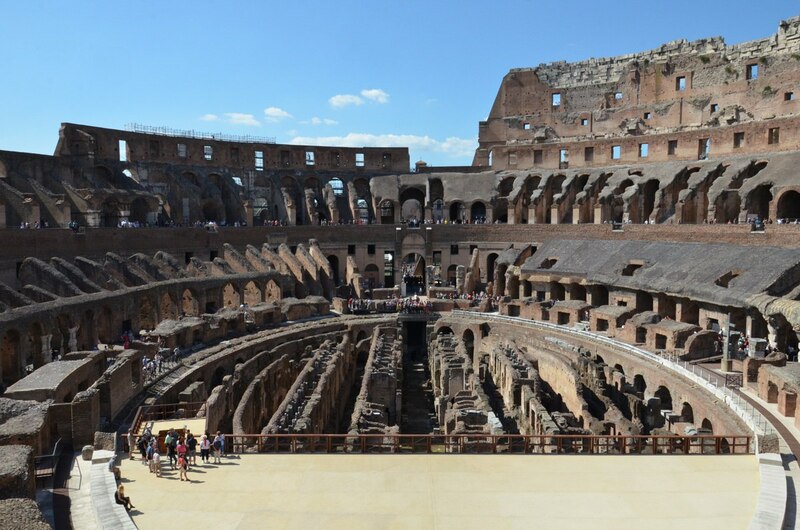 It is hard to imagine the overwhelming size of The Colosseum by seeing it captured in photos, but the elliptical stadium was host to between 50,000-80,000 spectators at any one event. The structure had 4 tiers of seating to accommodate people based on their social rank and class. 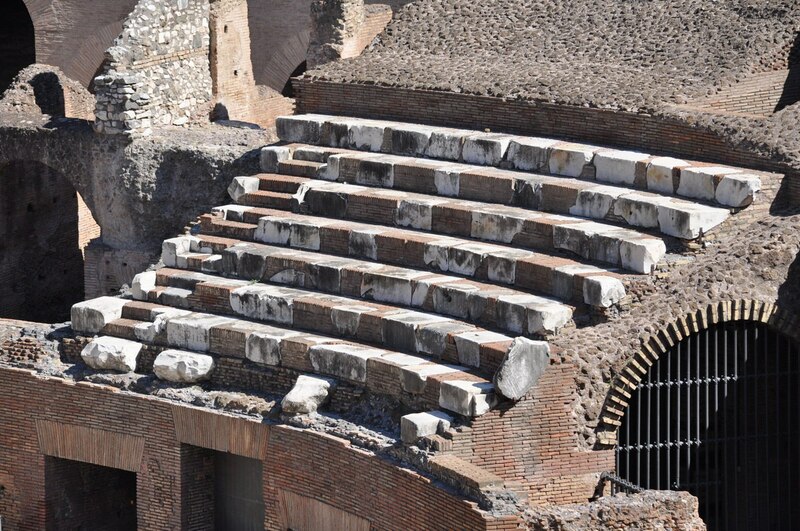 Wooden seats on the uppermost level were open to the public, and that is where women, slaves, the poor and those who were not Roman citizens were required to sit. The first and lowest level, that closest to the action, had seats reserved for the Senators; a bank of bleachers behind them catered to other government officials; and lastly, ordinary Roman citizens and soldiers occupied the rows of benches that ended just below the cheap seats. 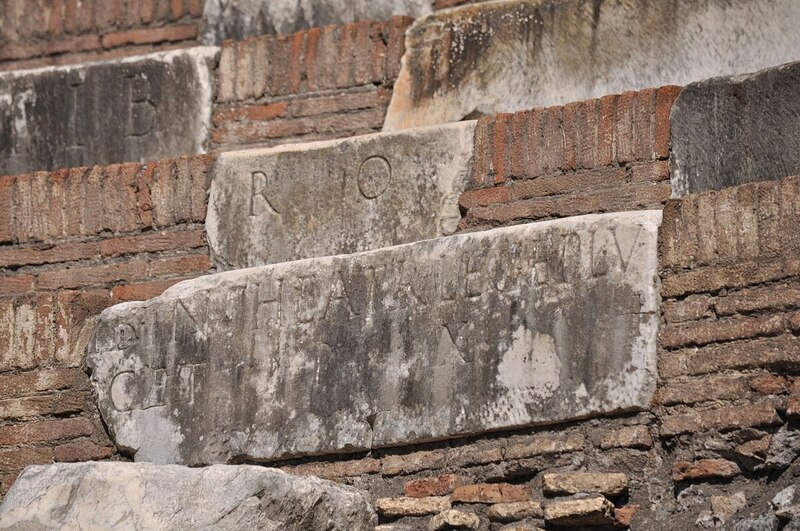 and when we joined a tour later in the day that gave us access to the floor of the arena, we had a good look at the inscriptions on some of the blocks of marble. 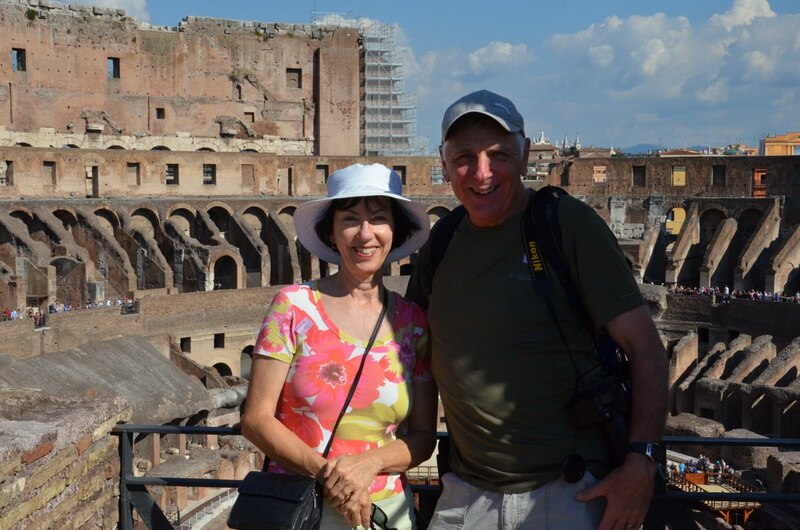 After completing our own first look at The Colosseum, Bob and I then purchased a ticket for a group tour with a guide to enlighten us further. Over the afternoon, the temperature was a searing 27 Celsius made all the hotter by the micro-climate created within the towering walls of the amphitheatre. 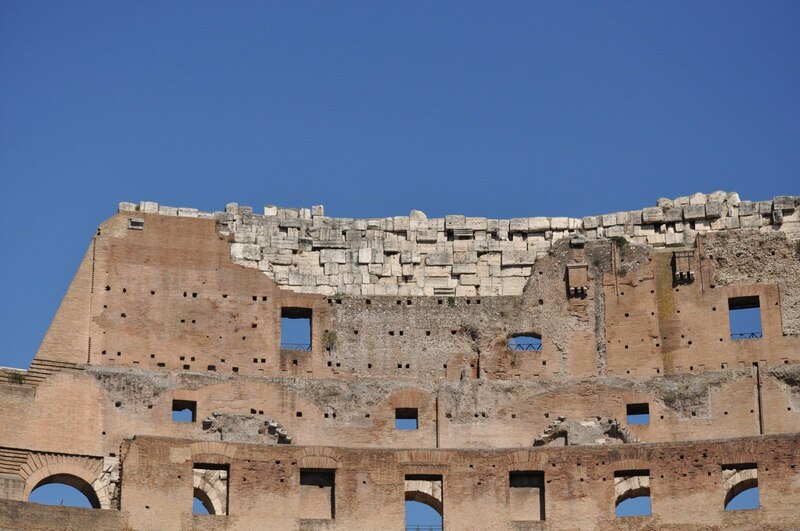 Our guide informed us that, in Roman times, the privileged spectators attending events had the benefit of wooden roofs over the lower levels, and an awning called a velarium was erected across the top of the open stadium to protect all spectators from the elements. 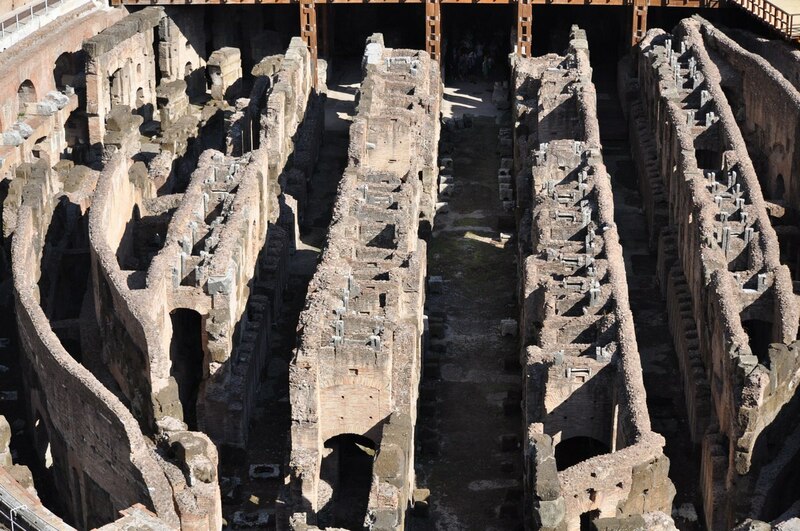 The remnants of what were some of the wooden roofs can be seen here, but it was rather difficult to envision the retractable awning stretched between short masts that protruded from the top of the walls. Weighing in at 24 tons, it required 1,000 sailors to hoist and secure it. With our English tour complete, Bob and I found a shaded alcove where we could rest away from the thousands of tourists. We settled on some steps where once the Plebeians walked to reach the wooden seats and waited for a behind-the-scenes tour at 3 o’clock. This time the commentary would be in Italian because all English-speaking tours had been booked months in advance. And then, there we were, out in the centre of the arena where at one time great public spectacles unfolded. It was hard to believe that Bob and I were standing where once gladiators fought in combat, mock sea battles were staged, animals were hunted to the death, executions were carried out, and elaborate dramas enacted. During the inaugural games alone, which lasted an astonishing 100 days, over 3,000 gladiator fights ensued and over 9,000 wild animals were slaughtered. Is it any wonder that sand used to be spread generously from one end of the wooden floor to the other? 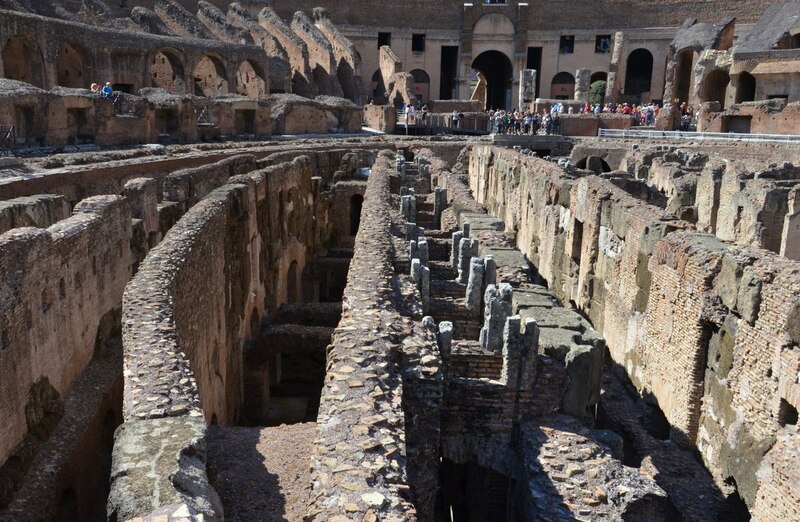 It was necessary to soak up all the blood from the “games” to prevent it seeping into the hypogeum, the labrynthian array of passages that lay underground. From the edge of the wooden platform, we had an excellent view of the framework underfoot. The subterranean infrastructure was complex and capable of supporting all the intricacies of the complicated productions. The spectators expected grandiose shows, and awe-inspiring spectacles were delivered. For mock naval battles, the wooden floor of the arena was flooded to make a lake. Scenery changes featured forests of trees together with plants, streams and even mountains. Animals and actors had to miraculously appear with precision timing. No detail was spared. 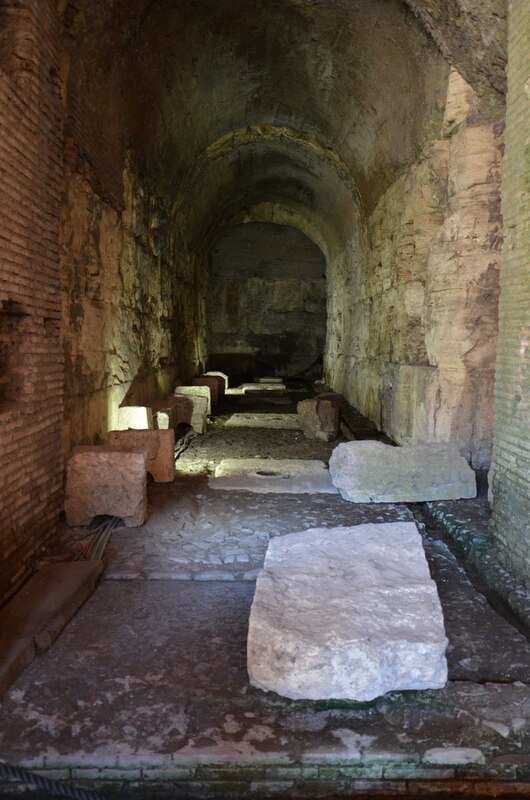 All complexities were engineered from the two-storey underground network of tunnels, pens, chambers, shafts, passages, and trap doors that combined into one maze called the hypogeum. Tunnels were used to usher into the holding area the wild beasts that were housed in outlying buildings. 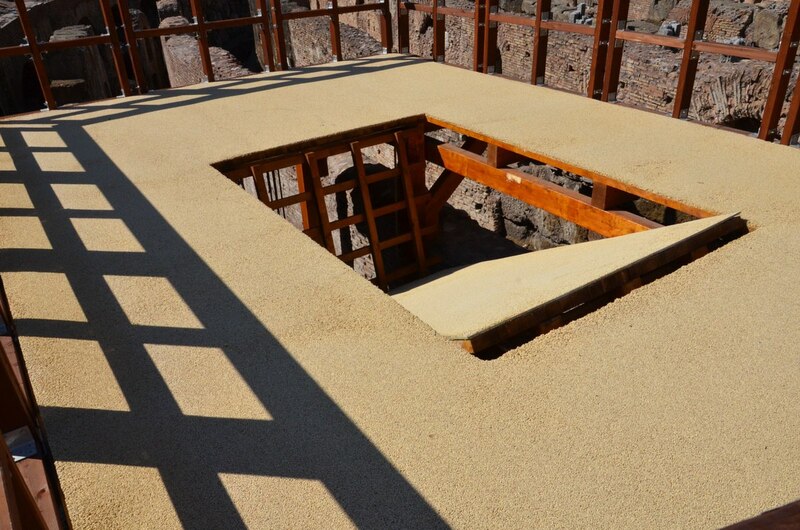 On the left side of the partial wooden floor where we stood, one of the trap doors had been reconstructed. 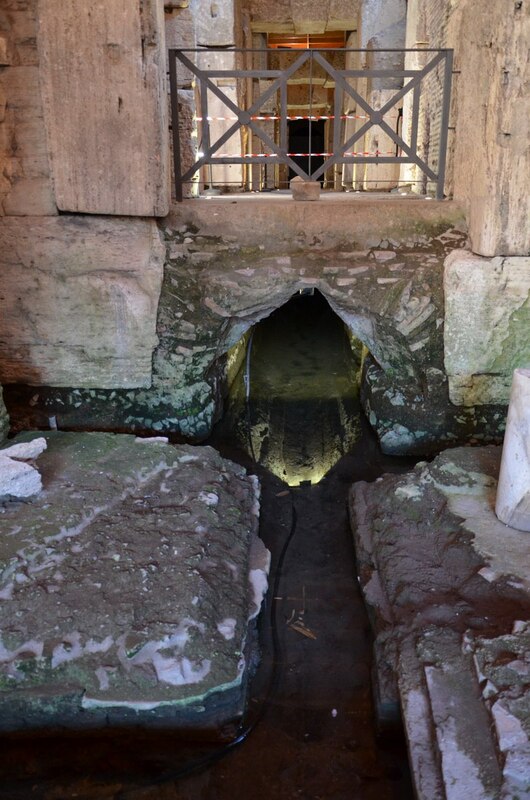 We would get an explanation as to how it operated once guided to the hypogeum. Our Italian guide reiterated everything that we had learned from our English-speaking tour guide earlier in the day, a fact confirmed by a young man from England who was fluent in both English and Italian. Without the distraction of commentary, Bob and I were able to focus on the atmosphere that oozes from the ancient building’s walls. As we descended below ground, cool air washed over our bodies. The same conditions did not exist when slaves worked in the cramped quarters. Oil lamps not only lit the dark recesses but also added to the heat amplifying the stench of blood, excrement and dead bodies. Add to that the thunderous roar of the crowds, creaking machinery, and a deafening cacophony to which animals, people, musical instruments and the actual fighting overhead all contributed, and it would have been unbearable. 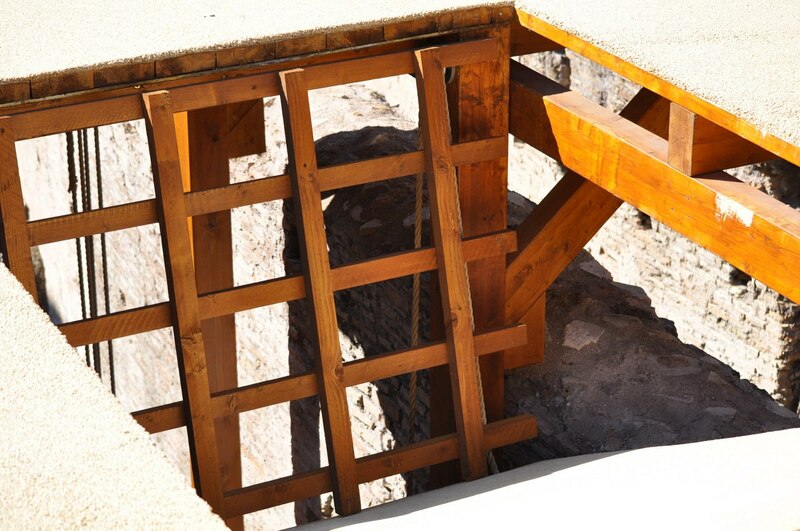 Once under the floor, we could visualize the slaves’ frantic activities that guaranteed instant access to the arena above for the animals, warriors, actors and scenery. Evidence of winches and pulleys were pointed out to us by the guide. 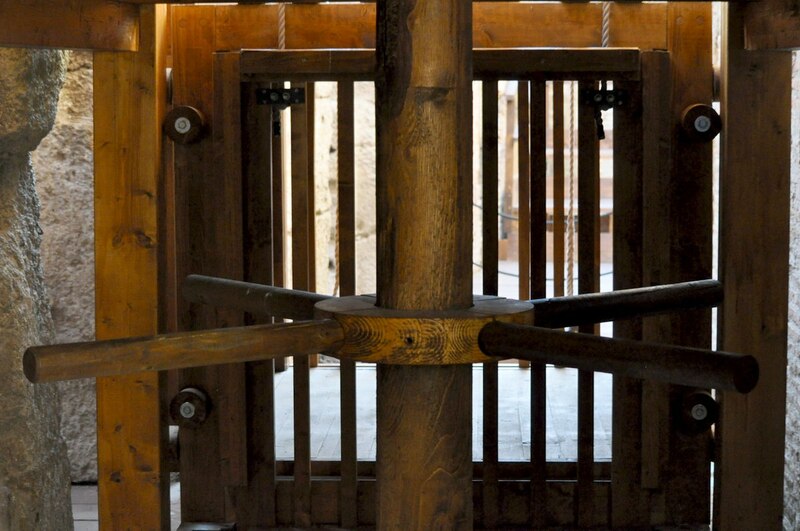 This reconstructed lift or elevator suggests how slaves could lift gladiators, props and caged animals to the floor of the arena in a timely fashion. 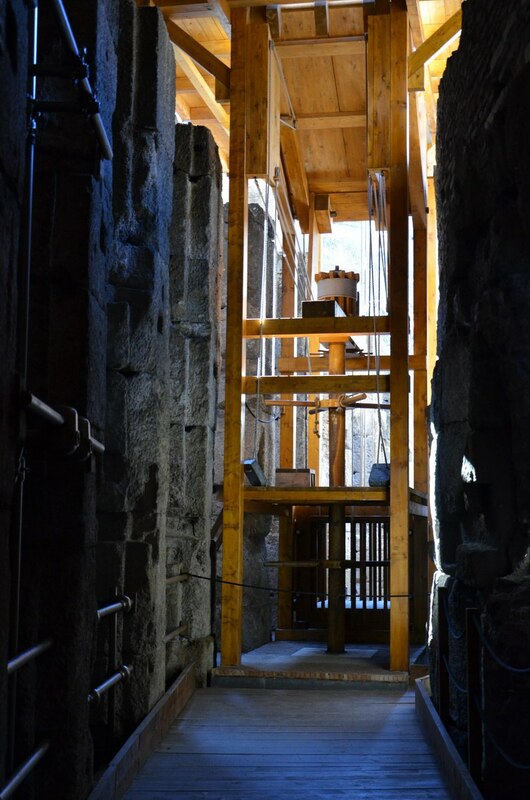 Originally, there were 80 vertical shafts and 32 rope-operated trap doors that allowed for elaborate special effects. For very large exotic animals like elephants, rhinoceroses or hippopotamuses, the slaves utilized even larger hinged platforms that were hoisted by pulleys. 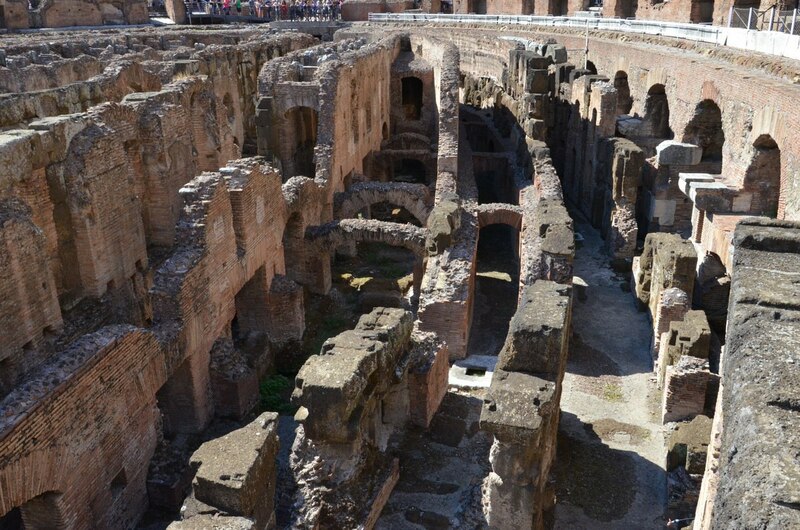 One thing we had not anticipated seeing was evidence of the elaborate water and sewage system that existed in the bowels of The Colosseum. 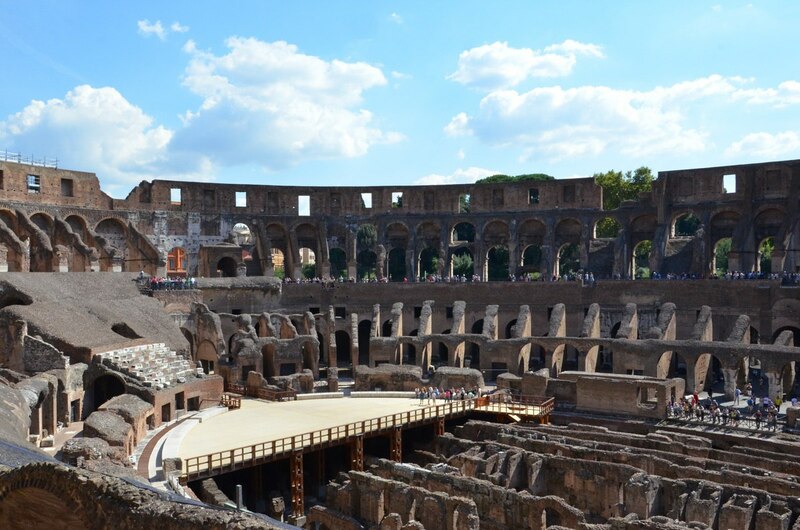 Ancient aqueducts once designed by the best Roman engineers were employed to bring water into and wash waste products out of The Colosseum. Of course beyond human waste, there was the gruesome detritus from all the fatal battles that had to be disposed of as well. 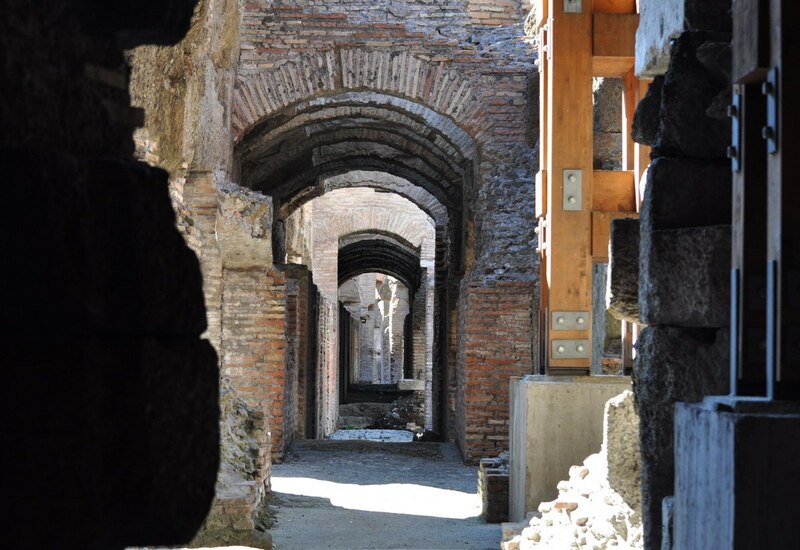 I have to admit that it was nice to resurface from the dank, narrow corridors that represented such death and destruction during Roman times. 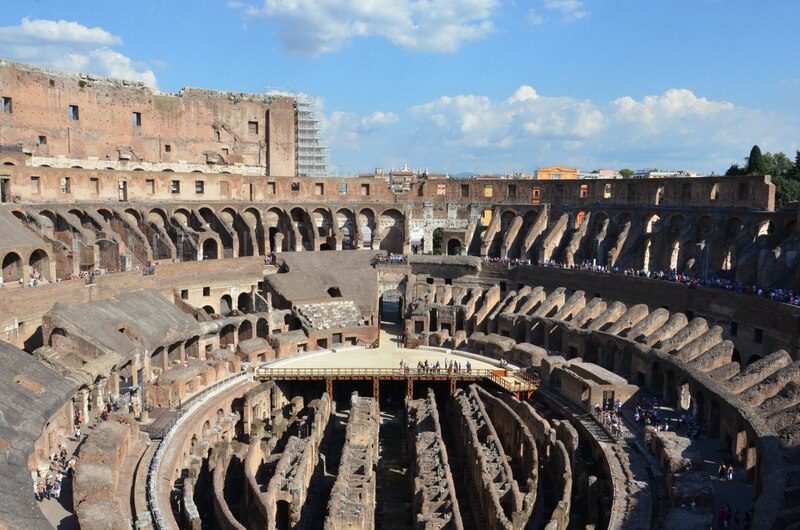 It is interesting to note that The Colosseum was no longer used for entertainment purposes starting in early Medieval times. Besides being used as a fortress for medieval clans, housing and religious quarters, over time, it was also plundered for building materials. 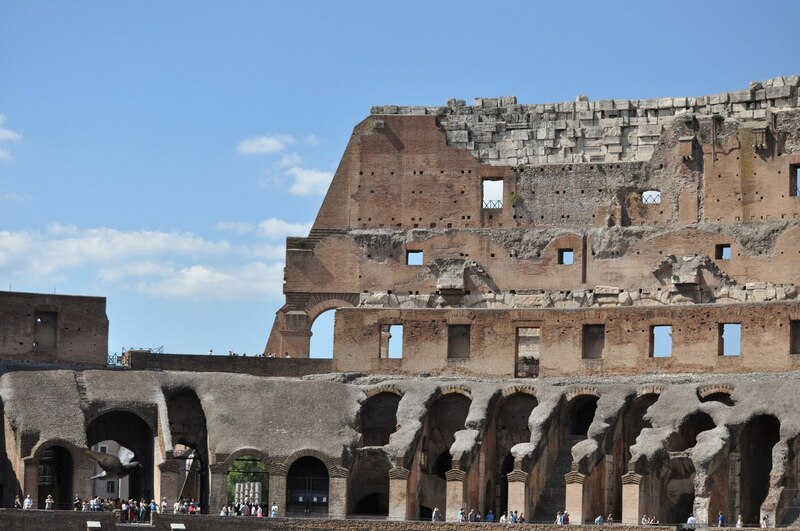 Damage during an earthquake in 1349 brought down tons of stone on the south side, stone that was salvaged for other buildings in Rome including St. Peter’s Basilica, palaces and hospitals. Sadly, the marble, iron and bronze was likewise stripped from the interior or pried out of the walls leaving all the holes that we could see scarring the structure even today. 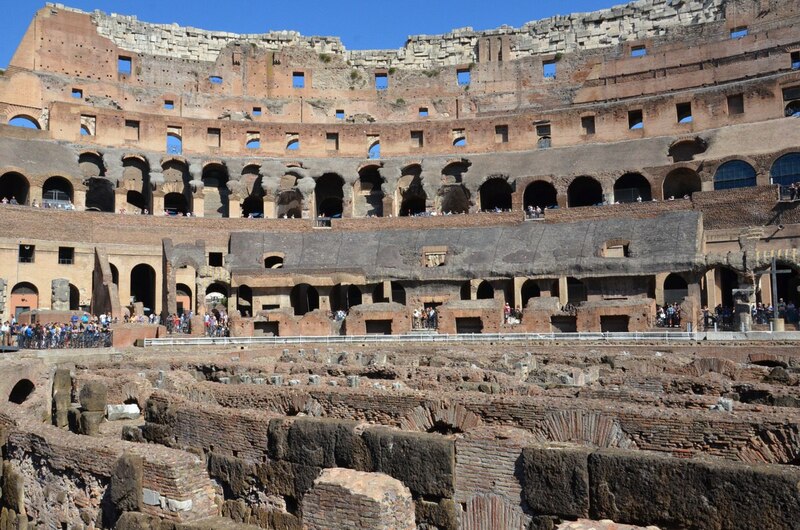 There is so much more that could be said about The Colosseum. The wealth of detail and scope of its history boggles the mind just as the sheer magnitude of the amphitheatre’s size diminishes everything in the nearby area. The beauty of the structure certainly goes without saying. 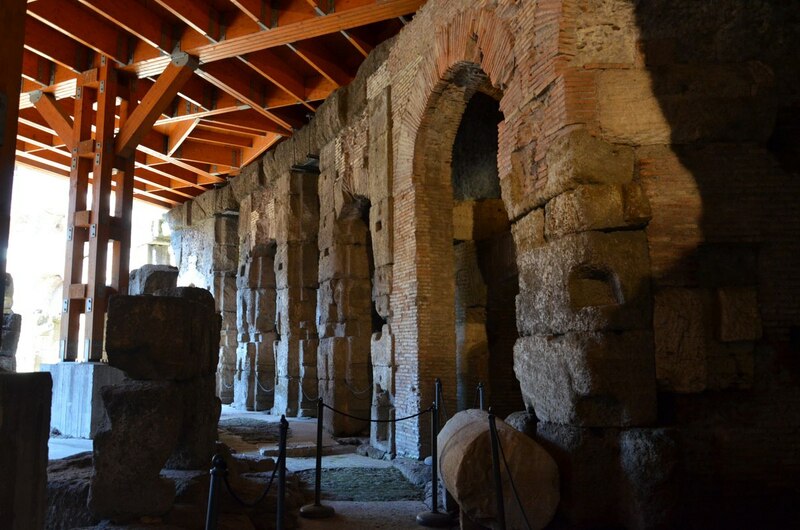 The use of arches not only was an important technique to distribute the weight of the building materials and make them strong, but contributes the most to the arena’s consummate beauty. 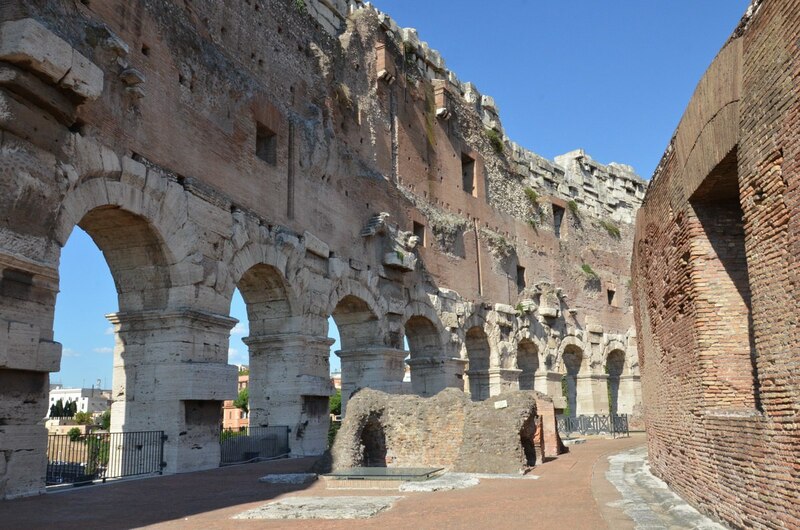 The distinctive 3-storeyed exterior features 80 arched entrances that in The Colosseum’s heyday would have displayed impressive statues fashioned from metal or marble, some even gilded with gold. Though the amphitheatre is a shadow of its former self, it is still celebrated for the masterful execution of the architect’s conception, while at the same time it stands as a stark reminder of the five centuries’ worth of coldblooded killing that took place there…the thousands of innocents, professional fighters and defenseless animals needlessly slaughtered.